Yamaha TMax 530. The TMax concept was born with the new millennium in 2001, when Yamaha decided to design a (maxi) scooter with "footprint" of motorcycle. Since then, some changes were made in your project, until in 2012 the TMax received the last attention of Japanese engineers: with lighter chassis and stronger engine, bicilíndrico propellant, 530 cc, fuel injection and cooling liquid , began to yield 46.2 hp. Two years later, the "new" version. Now, with one year of presence in our market and ten days under my responsibility, it is easier to make a mixed assessment - city and highway - this Maxiscooters. Many become frightened with the price, after all we do not have a European acceptance for this type of vehicle and, much less, the prices there. However, by focusing on the proposal of Tmax and the conditions under which the Brazilians live, especially in the chaotic traffic of the big cities, there is much to consider. The concept of the Yamaha scooter was leaving this the closest thing to a possible motorcycle. For starters, the engine is "inside" the aluminum frame and not attached to the rear wheel, as in other scooters. Thus, 5.3 kgfm torque is transmitted by a toothed belt. The greatest benefit of this technical solution is to improve the distribution of 221 kg (version of the running order tested with ABS brakes) on both axes and concentrate the weight in the center - avoiding that common sense back "heavy" of maxiscooters. Moreover, the final drive belt causes the throttle TMax responses are more instant and linear. This makes the TMax distance itself from the other scooters, because although it seems big and heavy, this Maxiscooters turns a small motorcycle so the pilot out of inertia. The wheel rim 15 'and the tires (120 / 70R in the front and 160 / 60R ago) contribute much to this "lightness" and stability. 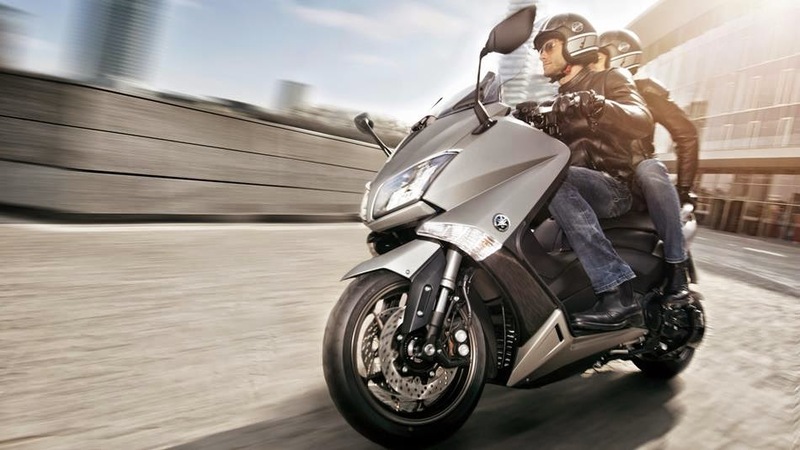 You can work around the curves with style and safety, but not the TMax does not make curves like a motorcycle! The swingarm, also in aluminum, is monocushioned as most motorcycles and carries the final drive and the motor. In practice, this means that when passing in ripples or cobblestones, the set does not move all that weight. Lighter, he is free to keep the wheel always on the floor. Thus, takes advantage of better engine torque and do not notice is the delay between the throttle and turning the "force" pushing TMax - common phenomenon of other scooters. Telescopic fork with 120 mm of travel front suspension and a set of brakes consists of double disc 267 mm in diameter at the front and single disc of 282 mm in diameter at the rear complete the cycling of the TMax. Although focus on the urban comfort, the suspensions are firm enough to run at 180 km / h stably and safely - as long as the route allow him such speed. The brakes also meet the expectations and despite the engine brake not active, because it is a scooter, stop the TMax without problem. A detail: the comfortable seat with lumbar backrest is high (80 cm from the ground) and leaves the pilot well above the windshield, which affect the aerodynamics at high speeds. It can regulate the windshield on two levels, but it requires an Allen key to both, making the process and remaining low for a tall driver (1.90m in my case). As we have seen, the propellant two-cylinder generates a maximum power of 46.5 hp at 6750 rpm and a maximum torque of 5.3 kgf.ma 5250 rpm. And even if the TMax delivered a good start to the pilot, will be in the schemes above 4000 rpm the driver to excite. 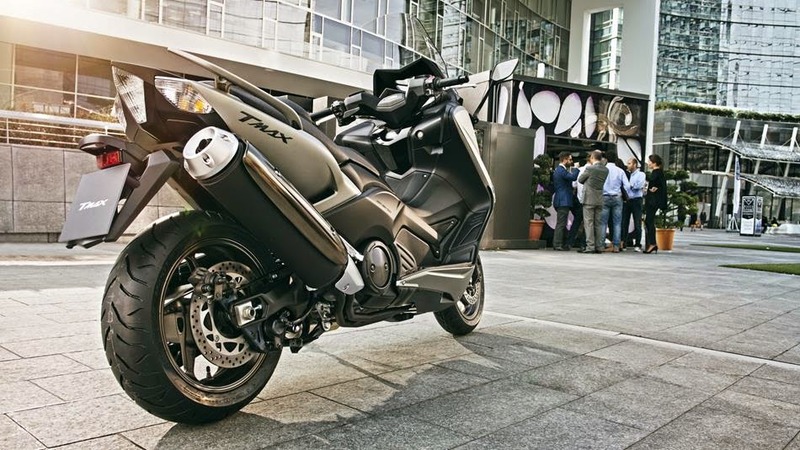 The long, single exhaust tip gets the job with a more serious tone than expected and despite the CVT (with pulleys variables), as in other scooters, the rush of TMax is quite interesting. There is plenty of torque to go from 0 to 100 km / h faster than many bikes, after all is not lost time to switch gears. Even steeper climbs, the TMax progresses speed without problem, just open the throttle. And it open, it was possible to reach the maximum speed recorded by analog speedometer, with stability and sense of security. The same sentiment reaches the croup. 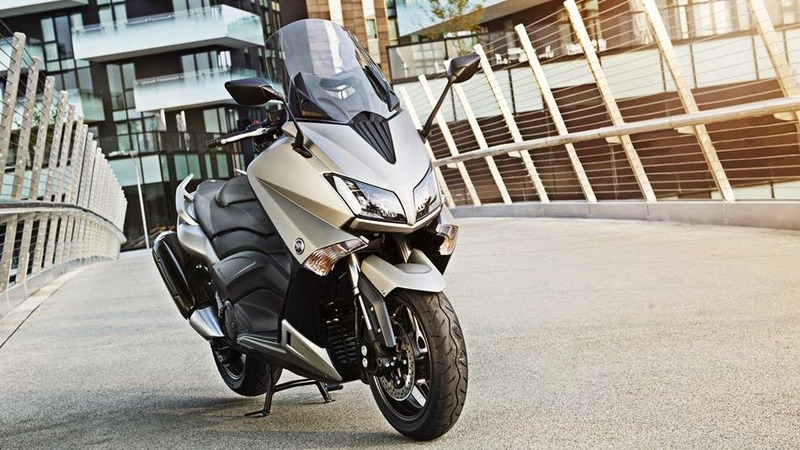 With many practical compartments in the front shield and soft banks that do not tire on longer trips, the TMax ensures comfort for miles to the pilot and the passenger. In the city, it is a maxisccoter, the TMax loses some its lightness. However, it is necessary to compare it to smaller scooters, because for a giant of more than 200 kg the TMax offers a great angle of manure, as well as an enviable consumption: 18.4 km / l in city and 21.2 km / l on the road. The negative highlight is the space under the seat. With the motor attached to the frame, you can save only one full-face helmet - the tested model was equipped with a bag of 50 liters which costs R $ 937.29. For whom? Seeking to answer this question hit a conversation with the lawyer Paulo Sergio Moreira Gomes, 50 years. For him, who owns a BMW C 600 and a TMax 530, the Maxiscooter Yamaha offers "excellent handling is very agile in traffic, with good output torque, light weight and excellent design. But sin in the central chest closure and offers little storage capacity. " It is always a difficult task to say for whom a vehicle is made. What I can say is that the TMax is a very good product for its proposal. It is rather difficult to find defects in this Maxiscooters. Yes, it is expensive for the average of the european reality. But yes, it delivers every penny to the pilot. So, I'd say not worth it if you buy it expecting to ride on motorcycle. Now, if you're a fan of (maxi) scooter and search a great choice among vehicles in this segment, the TMax will meet all your needs.